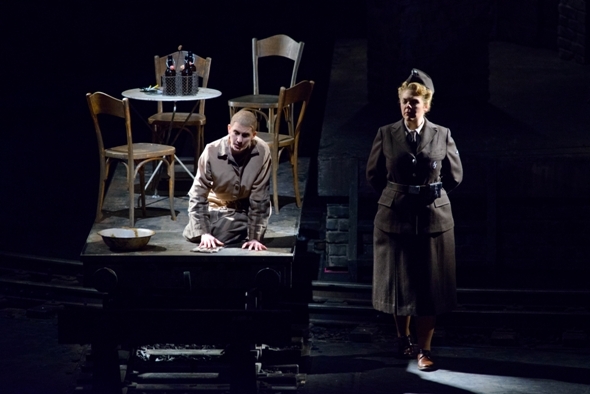 The first impression of “The Passenger” by the Soviet composer Mieczysław Weinberg, whose Holocaust-inspired 1968 opera has been circulating the globe since its belated 2010 world premiere, is that of a major composer in his prime. Typically referred to as a lesser-known, younger member of Shostakovich’s inner circle, Weinberg was subjected to harsh waves of suppression and punishment. But it is wrong to think of this Polish-born Jew, who lived in Moscow most of his life, as a composer locked away from the rest of the world. Accidents of circumstance have made him little known to us in the West. But what this up-to-the-minute score from way-back then reveals is a composer fully on top of musical developments inside and outside the Soviet realm. Conducted with searing authority by Andrew Davis, the illuminating Lyric Opera of Chicago presentation of “The Passenger” seemed familiar right away. 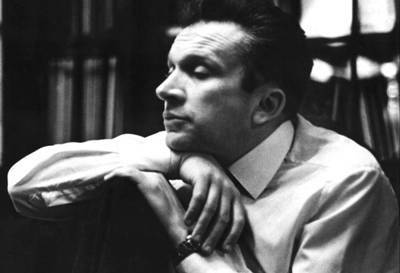 One could hear from the violins at the outset, and later from the choruses, that Weinberg had assimilated “Peter Grimes,” the “War Requiem” and other Britten scores known to him from Shostakovich’s extensive library. It was certain that he was eye-to-eye with Shostakovich himself, so drolly to the purpose did he quote the famous whisper ostinato with its relentless crescendo from the Seventh Symphony that Shostakovich had used as a metaphor for the German invasion. Stravinsky’s brilliant use of orchestral color seemed completely absorbed and transformed. Ditto the expressive devices of Berg, Bartok and Prokofiev. Even popular music of the ’50s, the time in which the story is set, was drawn effortlessly onboard. 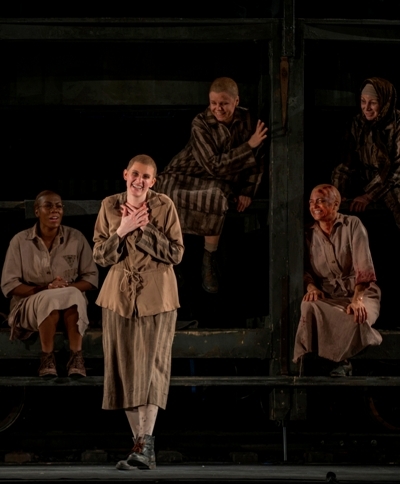 Modern audiences are not yet familiar with “The Passenger,” this stunning opera about a German woman, Liese, with a secret past unbeknownst to her husband as an Auschwitz overseer, but the psychologically shrewd and insightful opus seems destined to take its place in the heart of the 20th-century canon. Liese is shocked into a crisis of conscience when she thinks she sees a woman who should be long gone, a female inmate from Auschwitz whose death Liese sought to bring about. The focus of the story then turns to Marta, a charismatic Polish political prisoner, barely 20, whose refusal to be manipulated triggers Liese’s frustration and anger..
Marta discovers one day that her fiancé, Tadeusz, a violinist presumed dead, is actually alive in the same camp. Spying them together, Liese attempts to use the knowledge of their secret to bring them under her control. But they resist and are condemned, spectacularly in the case of Tadeusz. Part of the tale’s richness, as structured by Weinberg and the librettist Alexander Medvedev, is that Marta’s fate is left unclear. You can interpret the whole story as a psychic break on Liese’s part, with Marta’s appearance a figment of her imagination, or not. Director David Pountney and his frequent collaborator, the late designer Johan Engels, played brilliantly with that ambiguity. 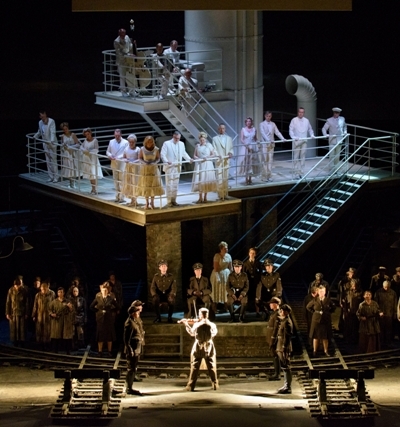 The two-tier set, hauntingly lit by Fabrice Kebour, is sufficiently abstract to suggest an ocean liner above and the bowels of Auschwitz below. The the upper level is shiny and surreal, with everyone attired in white so bright that it could be a dream. (Costumes of Marie-Jeanne Lecca were spot on.) The bleak horror of the camp below is delineated by spare elements suggesting barracks and boredom, the ash of ovens and railroad tracks at the bitter end of the line. Members of the Lyric Opera Chorus, in dark attire, offered commentary from a vague realm between the two worlds. They were mesmerizing as they warned of the “pitch-black wall of death” and soothing in their gentle echoes of the will to survive. In “The Passenger’s” strong cast there are some enormous roles. 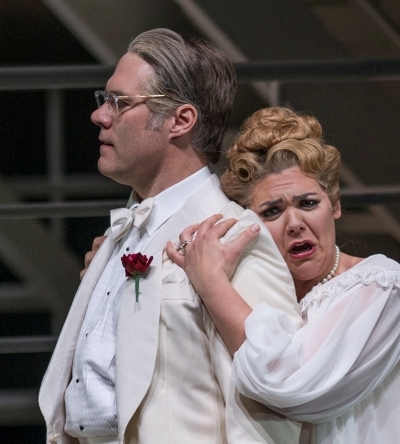 Mezzo-soprano Daveda Karanas, who last season sang Kundry in Wagner’s Parsifal, is riveting as the panicked woman Liese, now in midlife, who seems to be on the brink of a new life, with her husband of 15 years. They are bound for his diplomatic appointment in Brazil, about to be gone from Germany for good, except for the tripwire — on the boat or in her mind. Will she get away with it? Liese’s life threatens to crash around her. The composer and librettist give this role spectacular material and Karanas makes good use of it, seemingly distracted from the start, her music fringed with Hitchcockian worry even before she catches sight of the mysterious woman who gives her such a fright. In several intricately timed, unforgettable scenes with tenor Brandon Jovanovich — as Walter, the blind-sided husband who suddenly sees himself as “the honorable diplomat with an SS wife … despicable, despicable, despicable!” — the stakes are made bluntly plain. A fine singer with real acting chops, Jovanovich is convincing as a mostly good guy, with a propped-up image of himself that he is keen to defend. It has been 15 years. In for a dime, in for a dollar. 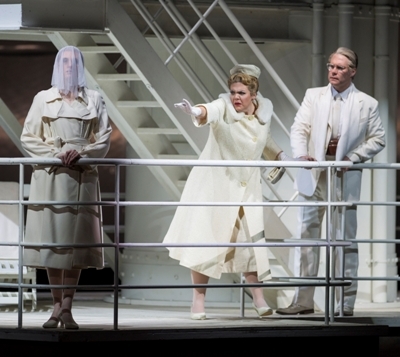 More titanic still is the role of Marta, sung by soprano Amanda Majeski, who continues to mature in major roles at the Lyric after two years in the Ryan Opera Center training program and debuts in several international houses. In her best acting performance that I have witnessed so far, in a role that seems custom-made, Majeski is lovely at the center of a well-differentiated multilingual community of female inmates whom we get to know individually, and in her initial encounter with Tadeusz (baritone Joshua Hopkins in a solid Lyric debut) as the two erupt in giddy surprise. Marta’s centerpiece, an incandescent love song to her own death, which she imagines as a songbird celebrating her release from life and other sublime variants, suits Majeski well. Notable among Marta’s richly individualized community of barrack companions are soprano Kelly Kaduce as the tough-minded Russian freedom fighter Katya, who can’t quite remember all the words to the old folk song her grandmother used to sing; dramatic soprano Nina Warren as a crazed older woman who’s the only survivor from her group of arrivals, and mezzo-soprano Liuba Sokolova as determinedly faithful Bronka, who lights candles to God and insists He will not forget even the ones who have given themselves up utterly to the idea that they are forsaken. The entire cast was well chosen, and that includes the real violin player (Bernardo Arias) who doubled for Tadeusz at the moment he is called to give the performance of a lifetime. 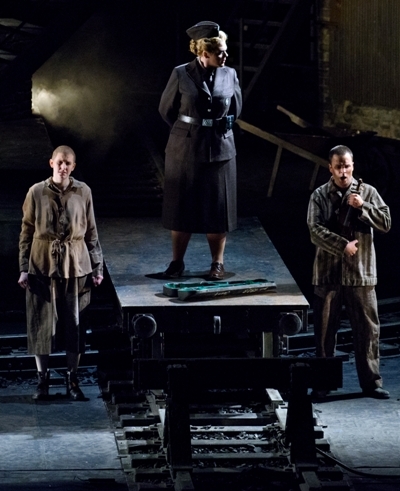 “The Passenger” is based on a spare and powerful semi-autobiographical novella by Zofia Posmysz — more on her story here — who, now age 91, was in attendance and took a bow. Pountney had staged the epilogue to be offered by a woman in contemporary dress who is singing to long-gone victims, “Your hearts are with me here,” and the ovation grew as people perhaps realized that in that way Posnysz and Marta were one.